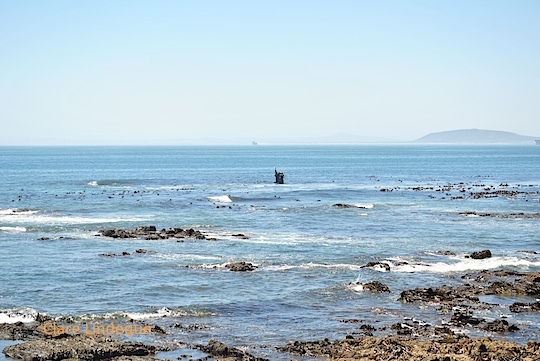 Twenty two new marine protected areas have been proposed for South Africa. The benefits of MPAs are well known, so this is excellent news for the future of our marine environment. 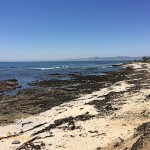 The public is invited to comment on the proposal, and as a responsible ocean loving individual, sending an email to comment would be one of the ways you can save the ocean. Read on to find out the details. 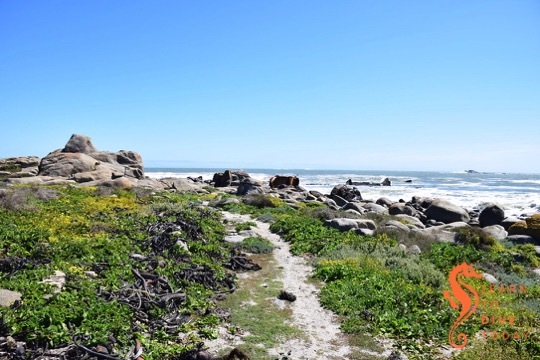 Many of these new MPAs aim to protect offshore ecosystems and species, ranging from deep areas along the Namibian border to a more than tenfold expansion of iSimangaliso Wetland Park in the KwaZulu-Natal Province. 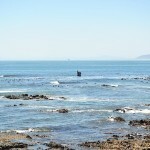 They include charismatic features, such as, fossilised yellow wood forest at a depth of 120m off Port Nolloth, a deep cold-water coral reef standing 30m high off the seabed near Port Elizabeth and a world famous diving destination where seven shark species aggregate, at Protea Banks in KwaZulu-Natal. These MPAs also include undersea mountains, canyons, sandy plains, deep and shallow muds and diverse gravel habitats with unique fauna. The new MPAs will secure protection of marine habitats like reefs, mangroves and coastal wetlands which are required to help protect coastal communities from the results of storm surges, rising sea-levels and extreme weather. Offshore, these MPAs will protect vulnerable habitats and secure spawning grounds for various marine species, therefore helping to sustain fisheries and ensure long-term benefits important to food and job security. 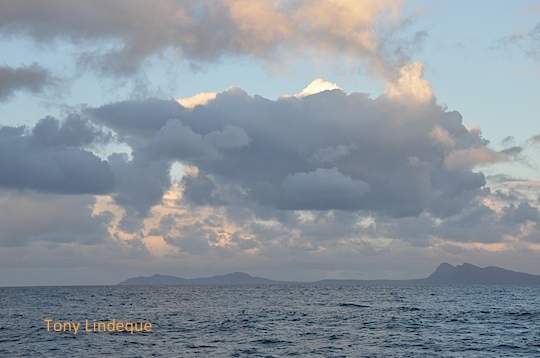 The new MPAs will increase the protected portion of South Africa’s territorial waters from less than 0.5%, to 5%. The government has undertaken to get this figure to 10% by 2019. 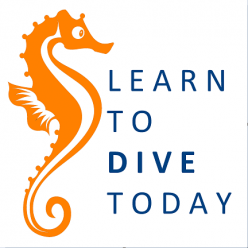 If you’re a scuba diver, you probably know that diving in a Marine Protected Area – particularly in a no-take zone – is an extra special experience because of the abundant fish and other marine life. The prospect of richer, more diverse dive sites to explore is an exciting one, but there are more benefits to this proposal than just enhanced eco-tourism opportunities. 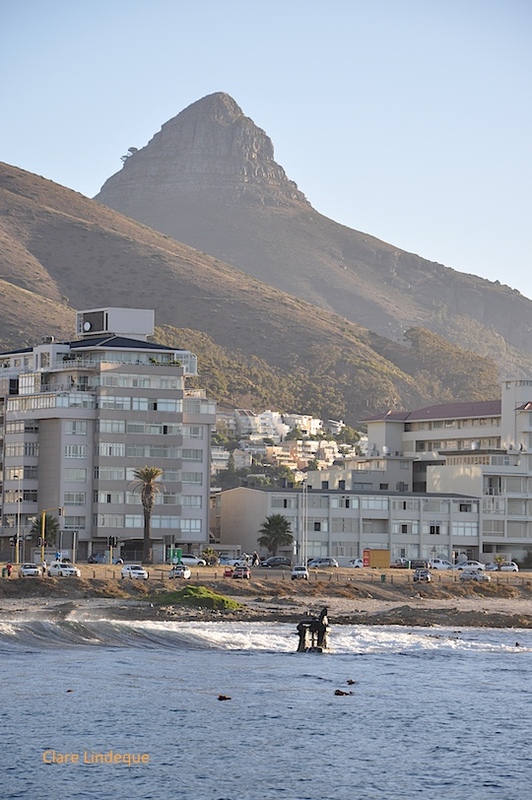 Scuba diving businesses will have to acquire permits from the Department of Environmental Affairs (for about R500 per year) to operate in the Marine Protected Areas. 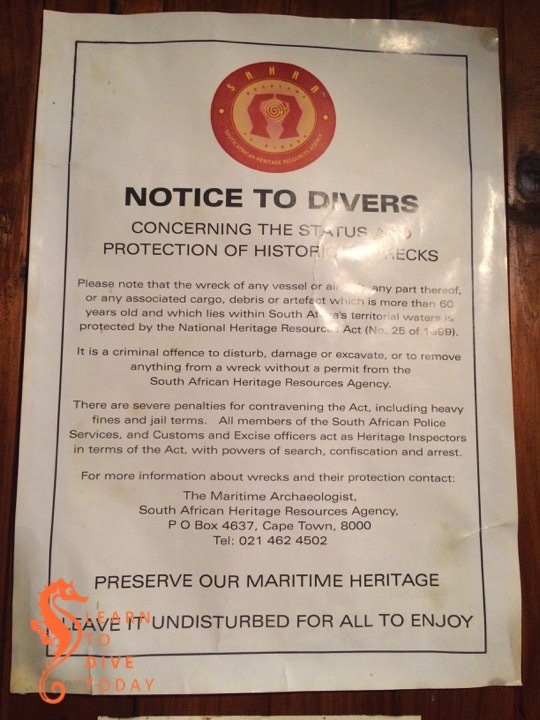 (This has been in force for some time, and ethical dive operators in Cape Town who take clients diving in any of the existing MPAs should be in possession of a permit already.) 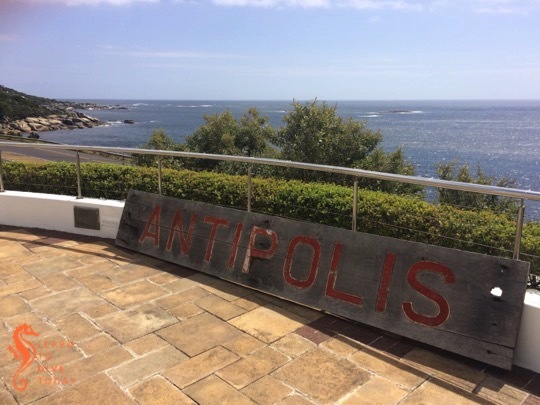 There are also the permits issued to individual scuba divers (for about R100 per year, obtainable at the post office) to dive in an MPA – you will see this mentioned in Tony’s newsletter now and then, as a reminder. Some of the new MPAs are in offshore regions that would otherwise be at risk from destructive trawl fishing and other exploitative activities such as mineral, oil and gas extraction from the seabed. Many of these MPAs will, like the Tsitsikamma MPA, serve as nurseries for fish stocks. Recreational and commercial fisheries will benefit from allowing the fish to spawn unmolested in protected areas along the coast. Holding ourselves back from fishing everywhere, at every opportunity, shows long-term thinking, and will have short-term benefits as well as for future generations. 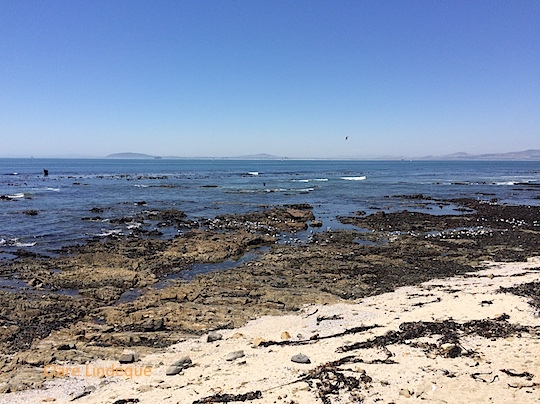 Not all of the MPAs will be closed to fishing – those of you familiar with the network of protected areas around the Cape Peninsula will be familiar with this idea. For example, a number of pelagic game- and baitfish species may be caught within the Controlled Pelagic Zones of the Amathole, iSimangaliso, Protea and Aliwal Shoal Marine Protected Areas. 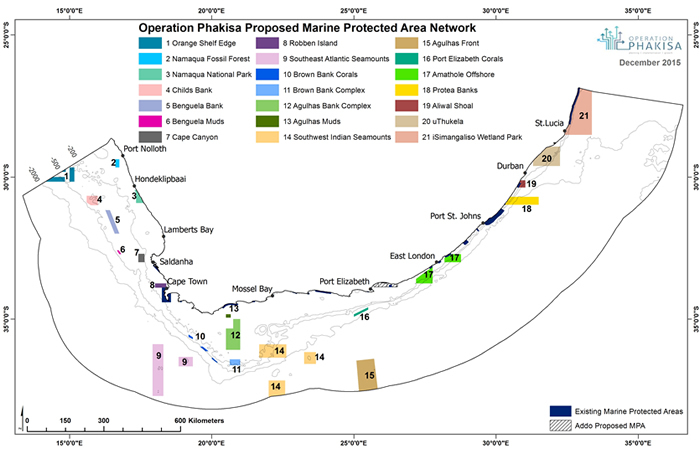 Commercial fishing permits may also be issued for use in the MPAs. 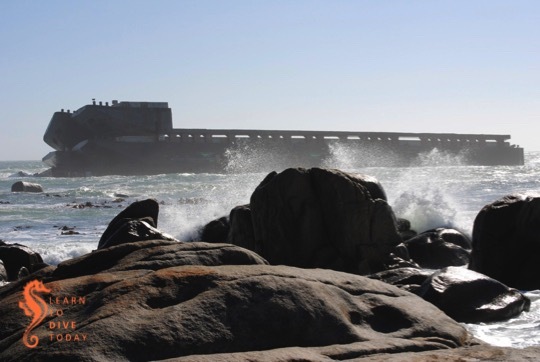 Existing discharges of effluent are permitted to continue – specifically into the Aliwal Shoal MPA. 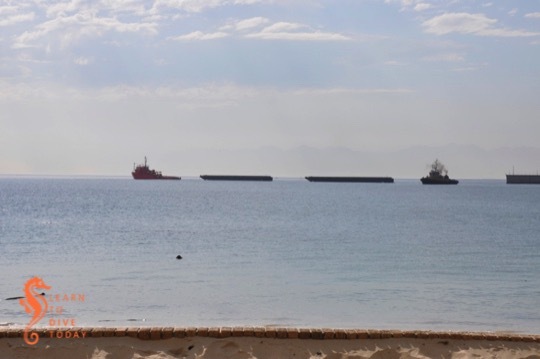 This means that SAPPI may continue to pump wood-pulp effluent onto the dive sites there. If you would like to show your support for the proposal – and who doesn’t love a well-chosen MPA? – send an email to MPARegs@environment.gov.za. You have until 2 May 2016 to do so, and you can include any other relevant comments about the MPA proposal in your missive. You can download the full document detailing the proposed new MPAs complete with maps, management regulations and co-ordinates (a 336 page pdf) here. This project has been spearheaded by a team at SANBI (the South African National Biodiversity Institute) led by Dr Kerry Sink. 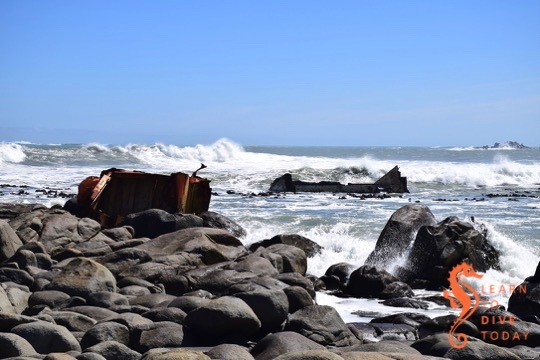 Dr Sink has been awarded a prestigious Pew Fellowship in Marine Conservation for 2016, and her fellowship work encompasses a range of projects aimed at strengthening and expanding South Africa’s network of Marine Protected Areas. We are extraordinarily fortunate to have a scientist and conservationist of Dr Sink’s calibre as a champion for MPAs in South Africa. So you can thank her! 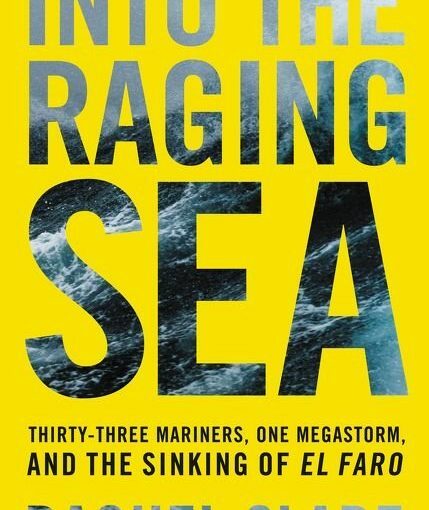 Journalist, activist and former war correspondent David Helvarg (who also wrote Saved by the Sea and 50 Ways to Save the Ocean) spent two years embedded with various branches of the US Coastguard in order to experience their work. 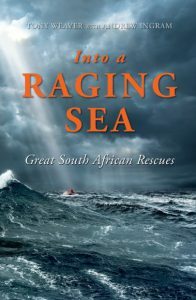 I had naively thought that the US Coastguard, despite being funded by the government, and despite their website having a .mil for military domain name, was just a slightly larger, more financially flush version of South Africa’s National Sea Rescue Institute (NSRI). I was wrong. 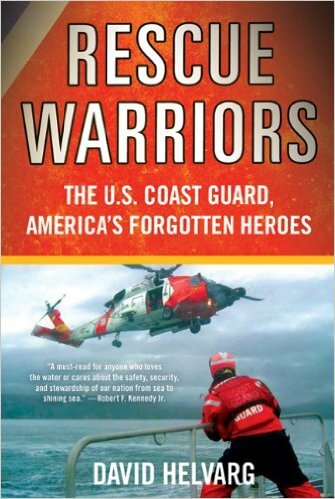 The mandate of the US Coastguard is to enforce maritime law (this is its primary difference from the NSRI) as well as to perform search and rescue operations. Viewers of the Deadliest Catch series will be familiar with the rescue work of the Coastguard in extremely challenging conditions. As a result of its law-enforcement mission, the Coastguard uses weapons and provides a lot more military-style training than you’d expect from a pure rescue operation. 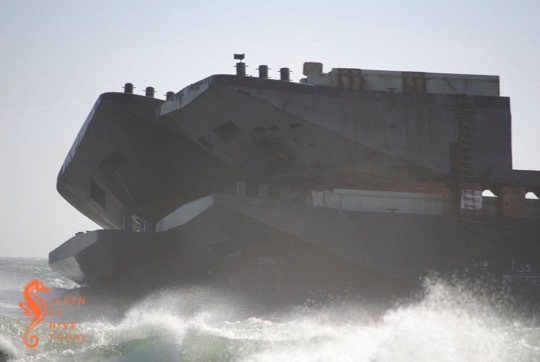 The Coastguard falls under the department of homeland security and operates cutters (with guns), icebreakers, small boats, helicopters, and other aircraft. 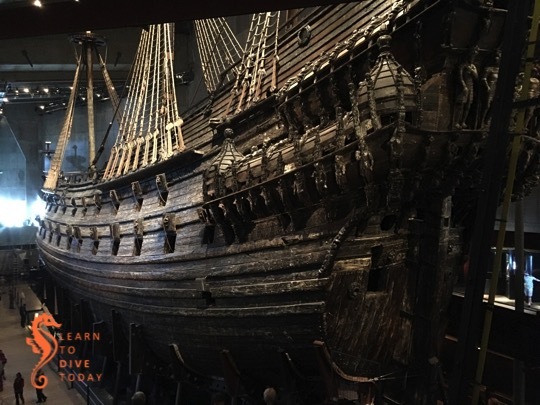 Helvarg’s conservationist tendencies shine through in several parts of Rescue Warriors, and he does not shy away from confronting the aspects of the Coastguard that he finds problematic. His contention is that the Coastguard receives far less publicity than it deserves. 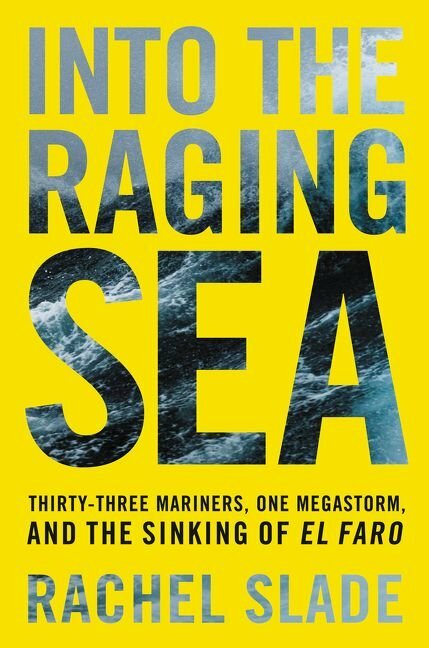 This book goes some way towards bringing attention to the individuals who have saved tens of thousands of people during Hurricane Katrina, via water evacuation during the September 11 attacks, and in countless other less well-known emergency situations. This is a gripping read which I thoroughly enjoyed. 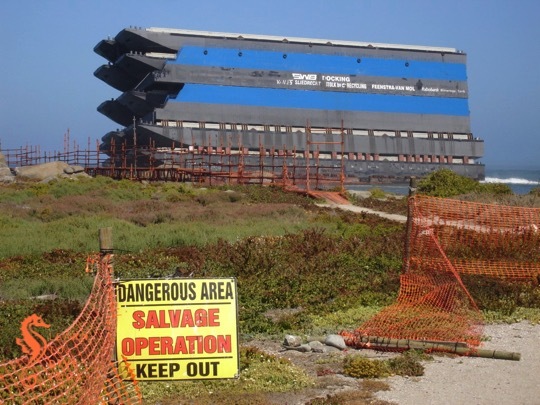 I was amazed by the amount of funding and equipment that the Coastguard has at its disposal compared to the NSRI, even though the organisation is actually badly underfunded, especially when considered relative to the rest of the United States war machine. I was also impressed by the egalitarian approach that draws many women to join the Coastguard and enables them to rise in its ranks. The Coastguard made all its jobs available to women in 1977, something which other branches of the military have not yet done. 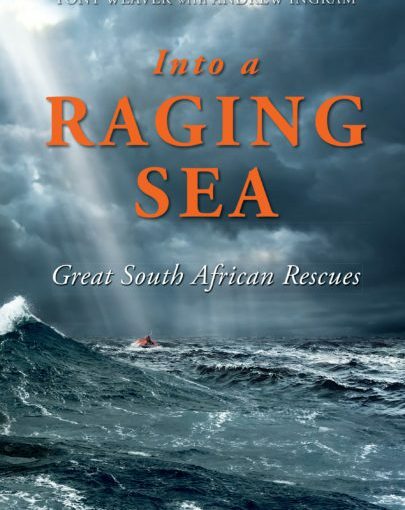 You can get a copy of the book here (South Africa), here or here. 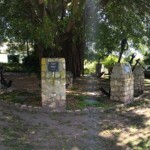 In the centre of Bredasdorp, the sleepy town in the Overberg that you will likely pass through on your way to De Hoop, Cape Agulhas, Arniston or any of the surrounding areas, is a museum devoted to shipwrecks. 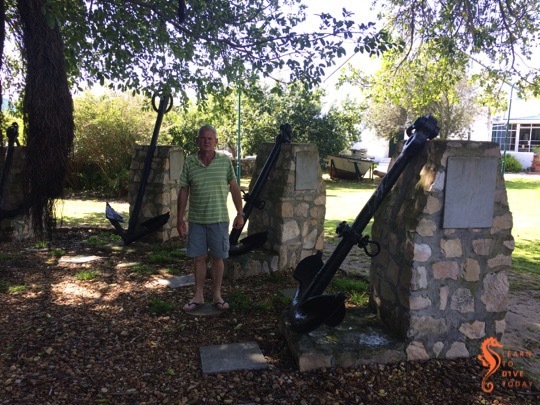 Tony and I paid it a visit while we were staying at De Hoop in September last year, and enjoyed it immensely. 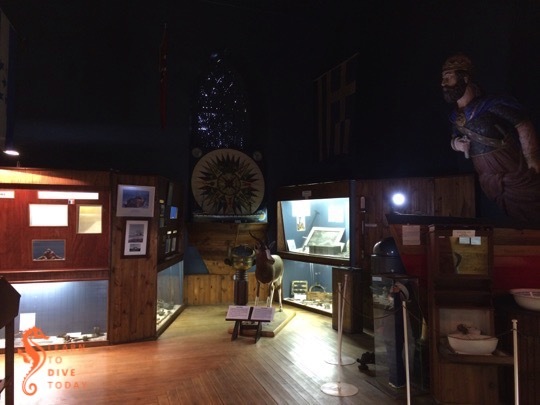 The museum is situated in an old church, and spills over into two other adjacent historical buildings. 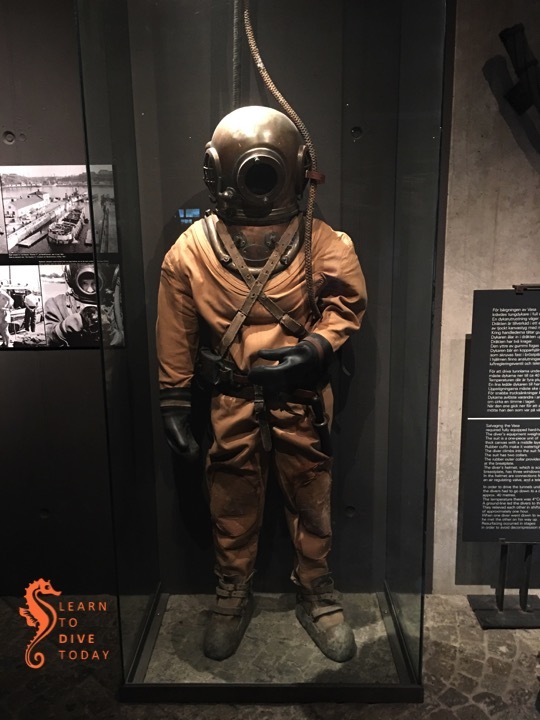 The shipwreck museum contains artefacts from a wide variety of wrecks – many of them from the coastline between Danger Point and Cape Agulhas, but others from further afield (including our neck of the woods)! 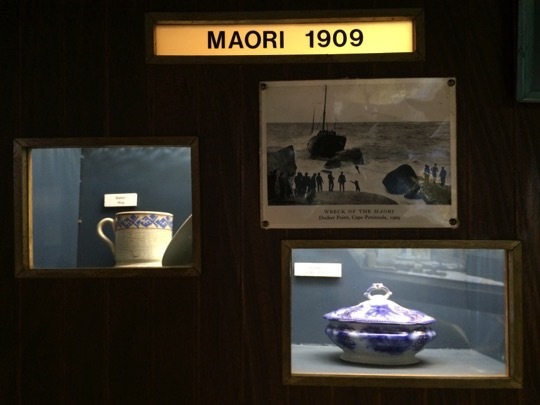 There is a display about SS Maori, including some of the pottery that was in the mixed cargo on the vessel. 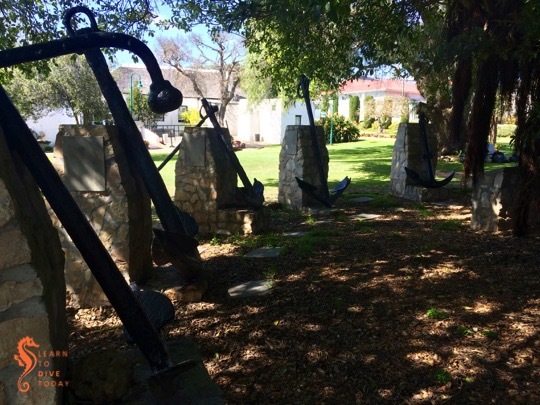 In addition to cargo items (including a vast array of bottles spanning a few hundred years of history), there are figureheads, binnacles, ship’s bells, cannons and anchors – the latter located outside in a beautiful garden behind the museum. 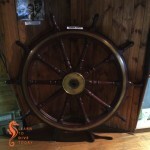 The ship’s wheel of SS Kadie, wrecked at the mouth of the Breede River, is also on display. The Arniston, Queen of the Thames, and Birkenhead wrecks also feature prominently. 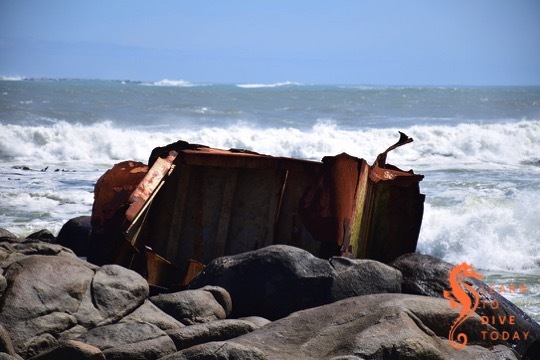 Familiarising yourself in advance with some details about the most prominent wrecks of the Overberg region will enrich your visit. A separate garage-like structure (technically known as the Old Coach House), accessible over a tiny river bridge in the garden, contains a historical fire engine, carriages and other vehicles and implements of everyday life from a century ago. 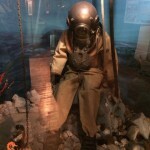 There is even a rocket-propelled breeches buoy apparatus, used from shore to rescue shipwreck survivors. 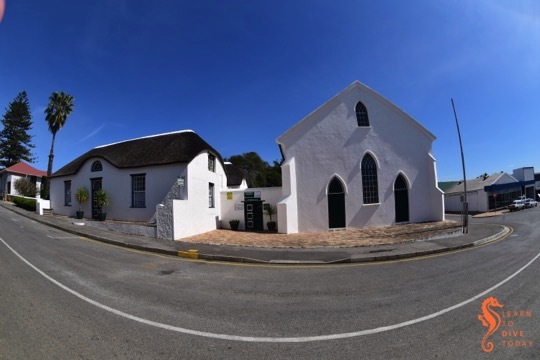 Another building included in the museum facilities is a fully furnished historical Overberg home called the Old Parsonage – when we walked through, there was even a (real live) cat having a cool nap on a hand-sewn quilt in one of the bedrooms. 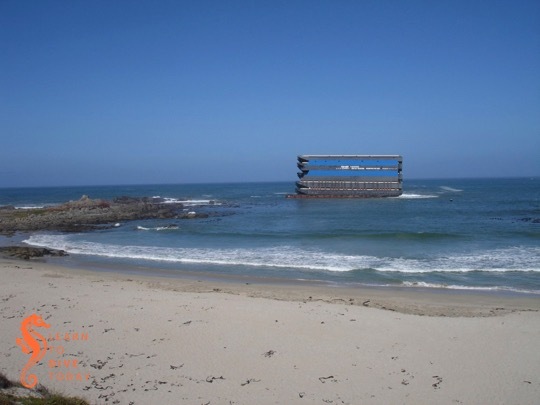 Since we’re thinking about shipwrecks, a reminder about South African legislation pertaining to historical wrecks is timely! 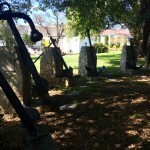 If you’re in the area the Bredasdorp Shipwreck Museum is definitely worth a visit. 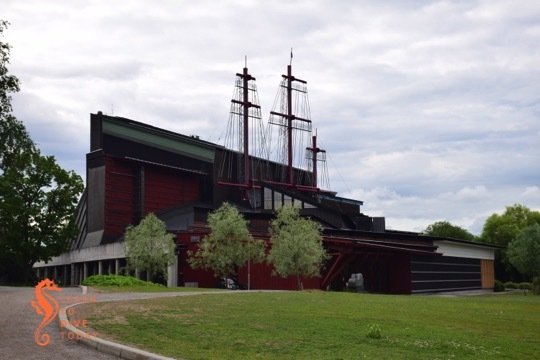 Opening hours and contact details can be found here. The entry fee is minimal. 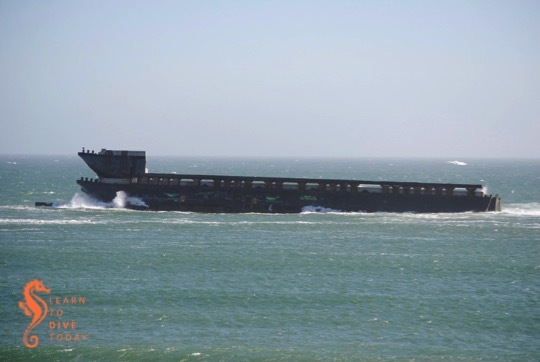 MV Antipolis ran aground off Oudekraal, along the Cape Peninsula’s western coast, in July 1977. 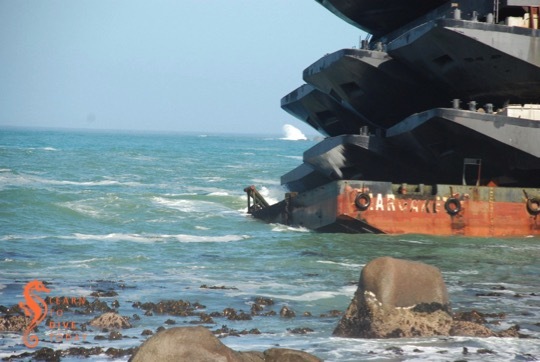 The wreck is visible at low tide, and can be seen from the deck at the nearby Twelve Apostles Hotel – you can admire it while drinking cocktails (or Fanta Grape, if you’re as wild as Tony and me) at the Leopard Bar. 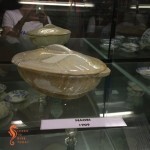 I was quite surprised to discover the (a?) 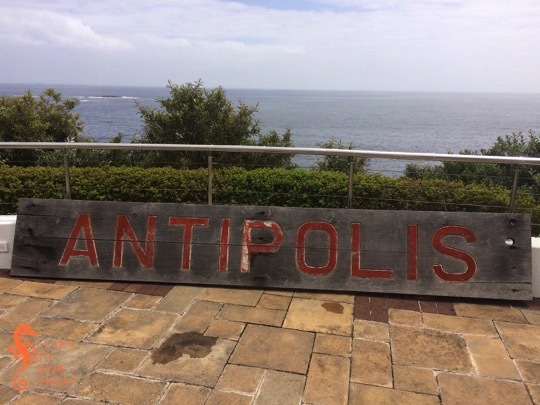 nameplate of the Antipolis, along with a small plaque commemorating the wreck, on the large terrace adjacent to the Leopard Bar, which I accessed during the course of a very lovely wedding at the hotel. I am sure that if you asked nicely, or moved smoothly like a lizard, you could do the same, even without a wedding invitation in hand. You might be able to crane your neck from the deck of the Leopard Bar, too. 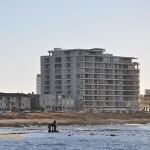 An observant visitor to the promenade between Mouille Point and Green Point may notice something man-made sticking out of the ocean, less than 100 metres from shore. This artifact is the iron engine block of the Royal Mail Steamer Athens, which ran aground here in the great north westerly gale of 17 May 1865. 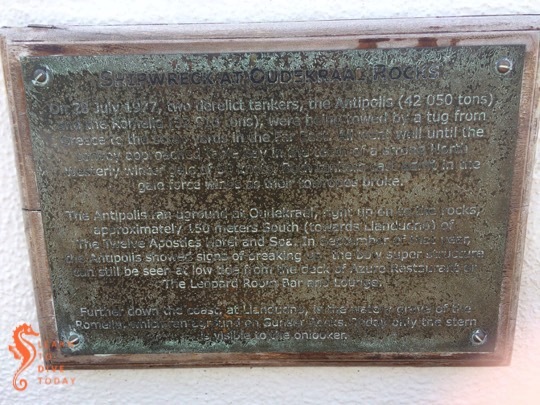 Seventeen ships were wrecked during this colossal gale – reports of the events of that day (including a mention of the Athens) can be seen in this historical newspaper. 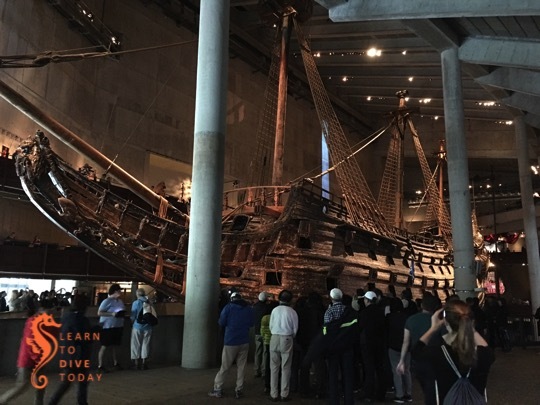 It is possible to dive the wreck; indeed, owing to its accessibility from shore, it has been extensively “salvaged” in the last 150-plus years! There is more information about diving the wreck on wikivoyage, but suffice it to say it’s a shallow dive best done when there is no swell to speak of. The wreck is very broken up and overgrown with kelp and invertebrate life, by all accounts. 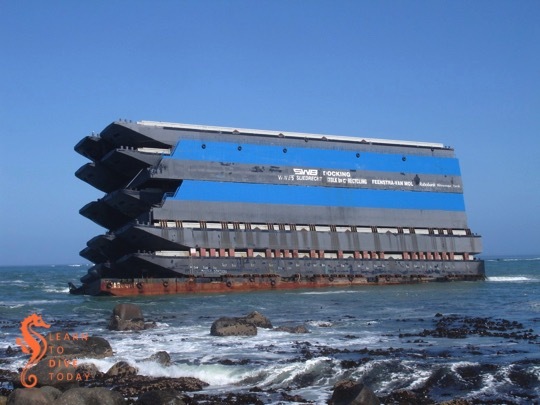 There’s a great article on the history of RMS Athens on the Submerge website: click here to read it. 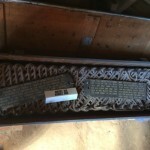 If you want to go and see the remains of the wreck, I’ve geotagged this instagram picture of the engine block. My photos of the engine block as seen from the sea were taken while we were aboard the Ocean Adventurer. 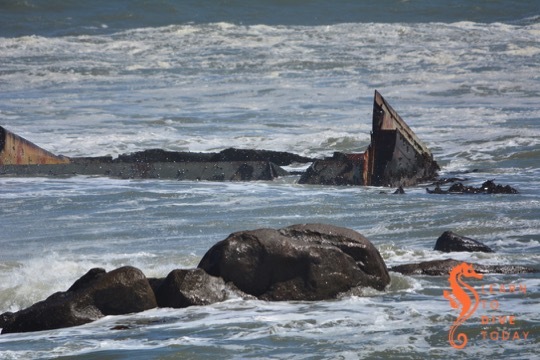 If you’re interested in other visible shipwrecks around Cape Town, you could visit the Kakapo, the Clan Stuart, and (by boat) the BOS 400, to start with!